It’s more of a mixed bag in St-Julien, Pauillac and St-Estèphe (3,300ha combined), and this is where so many of the prestigious chateaux are. I feel the wines, while still being of very high quality, are a long way short of what they were able to produce in 2009 and 2010 – so prices will be key. Please see my scores for each chateau, and the release price last year for an idea. I tasted many Crus Bourgeois wines and I struggled with those from the Médoc appellation (5,500 ha) in the far north of the left bank. There were some fine efforts but I’d be cautious and highly selective at this level on the left bank. South of Bordeaux, Pessac-Léognan (1,500 ha) was really successful for both reds and dry whites – likewise beyond, in the Graves (2,500 ha). On the right bank, I believe it’s an exceptional vintage for St-Emilion. This, again, covers a huge area (5,300 ha) so one shouldn’t generalise but at Grand Cru Classé level, and in other better terroirs, the wines are excellent – and many are not overpriced. Great vintages as they are, 2010 and 2009 produced blockbuster wines, while the 2015s are a pleasure to taste now, with good fruit, lovely texture and fine, ripe tannins. There are, as ever here, varying house styles. I do feel though that we’ve progressed from the days of massively extracted wines and the heavy use of oak. Many of the most sought-after wines from Pomerol (800 ha) will be oversubscribed, and expensive. It’s a seriously good vintage in Pomerol, and very good too in the ‘Libournais’ regions of Lalande de Pomerol (1,100 ha), Fronsac and Canon Fronsac (1,000 ha). The St-Emilion satellites (4,000 ha) enjoyed fine weather in late August and September and these, along with the Côtes de Bordeaux (13,500 ha) will be happy hunting grounds for Bordeaux lovers. Meanwhile, it’s an excellent vintage for both dry and sweet whites. The dry whites from Pessac-Leognan and sweet wines from Sauternes showed well. The dry whites have terrific intensity and concentration, and the Sauternes are rich and pure. Although there are plenty of reds that will be good to drink quite young, most of the better wines here are for mid to longer term drinking. A typical drinking window might be from 6 to 20 years, but many of the top wines need cellaring for ten years or more. This was my sixteenth consecutive year of tasting barrel samples from the top estates. 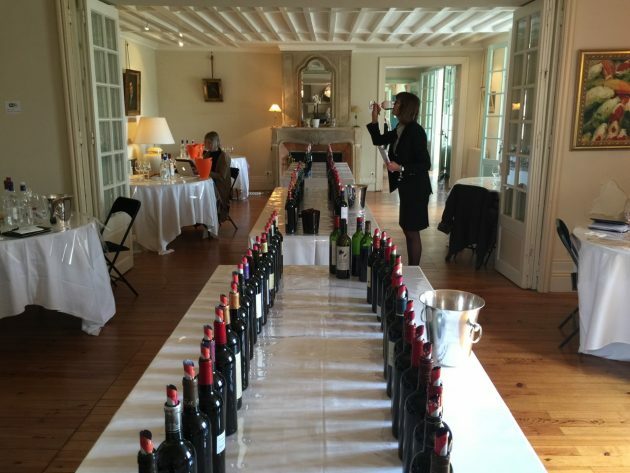 We have to remember, I think, that the ‘en primeur’ action – some might call it a circus – is mostly about the top wines of Pauillac, St-Julien, St-Estèphe, Margaux, Pessac-Leognan, Pomerol and Saint Emilion Grand Cru. Even if you tot up the entire area of these appellations, it’s still only 10% of Bordeaux, at 11,300 hectares out of 111,000. So the good news is that there’ll be plenty of less famous names than the 250 or so ‘brands’ that are sold as ‘futures’ that will offer terrific quality for the money when these wines are bottled. The quality of the wines, as shown in the barrel tastings earlier this month, isn’t really a surprise. “While 2015 may not be the vintage of the century for the reds, it will certainly go down as an excellent year,” I wrote in my harvest report last October. Like all the best years, 2015 was a dry season, with every month from March to October being drier than the average, except a notably rainy August. The foundation of the vintage was the excellent flowering in late May and early June, leading to good yields of uniform bunches, followed by refreshing rain in mid June, then hydric stress caused by no rain for six weeks in the second half of June and July. See my weather report for the detail. The welcome rain in August relieved the vineyards as the grapes changed colour. The even flowering (floraison) and the steady colour change (veraison) would allow for consistent ripening amongst the bunches later. After the August rain, it was dry and sunny at the end of the month and for the first ten days of September, when most of the dry whites were picked. Things were looking seriously good everywhere but then, just as the Merlot harvest began in some precocious vineyards, we had some strange weather. Thanks to the fallout from a distant tropical storm called Henri, we had showers one minute and sunshine the next. The amount of rain at this time, from 11 to 17 September, varied enormously from one sector to another, with 60-100mm in the northern Medoc, compared to 15-30mm further south in Margaux and the Graves and on the right bank. Crucially, it was pretty dry and sunny from Monday 21 September to Friday 2 October, and it was during these two working weeks that the majority of red grapes, both Merlots then Cabernets, were harvested in good conditions. September overall was comparatively cool – a full 2°C lower than the norm. The chateaux that continued harvesting had to work around intermittent rain from 2-6 October, after which it was dry. The vines have rarely looked healthier than in 2015, right up until the end of the harvest. For the reds, there was no rot to sort from the bunches. The sweet whites, meanwhile, were picked throughout September and in early October. The yields for the top appellations were generally higher than recent vintages. Margaux, St-Julien and St-Estephe, at 47, 48 and 49 hectolitres per hectare respectively, had their highest yields since 2006/2007. St-Emilion Grand Cru saw their highest for a decade, with 44hl/ha. Overall, Bordeaux produced 529 million litres in 2015 – the equivalent of a staggering 700 million bottles – which is exactly the average of the last ten years. There’s much to enjoy in 2015. For the reds, they show lovely balance, attractive fruit and fine, ripe tannins. There’s one word that the chateaux used more than any other to describe their wines – ‘freshness’. I’ve yet to be convinced that this is an expression that helps sell the wine – perhaps ‘fraicheur’ works better in French – but all professional tasters would have picked up on this character in the majority of the reds. This freshness undoubtedly comes from the rain in August and September, but also from the relative coolness of September in the build up to the harvest. 2˚C less than the norm is indeed a lot fresher. The flip side of the rain effect – where it fell most, that is – means that some of the more ‘serious’ wines of the northern Médoc lack some depth, complexity and weight in the middle palate. Perhaps we’ll see them fill out after a year more in barrel. Don’t forget that when it’s rainy and overcast, the sun doesn’t shine, and that’s why the wines are completely different to the great years of 2009 and 2010, when we had prolonged periods of sun during the harvest. The number of hours of sunshine in September was in line with the 30 year average.